The 17th Sigeman Co Chess Tournament is set to take place on 3-7th June 2009. The tournament will be played at the classical Hipp Theater in central Malmo, for the twelfth time. This year, the event has a new format, with only six players playing five rounds. 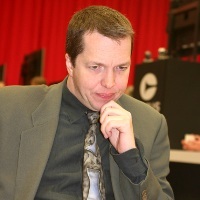 England’s legend GM Nigel Short, rated 2674, is the top-seeded player. Short is returning to Malmo after a seven years break, previously he had won the 2002 edition which was of 13th FIDE category. Earlier this year, Short played extremely well at the Corus B tournament, having long held a pole position, but in the end had to be satisfied with a shared 2nd place, behind Italian star Fabiano Caruana. Second seed is GM Ivan Sokolov (2669), who, as we just discovered after receiving message from the organizers, changed the chess federation and is back on Bosnia and Herzegovina list. Sokolov represented Netherlands at the 2007 European Team Chess Championship, but was notably absent from the Dresden Olympiad. Sokolov recently published a new book, “Winning Chess Middlegames”, which was very well received by the readers. Finnish top player GM Tomi Nybäck (2655) is making his debut at Sigeman Co, while the hosting country Sweden will be represented by two top Grandmasters Tiger Hillarp Persson (2618) and Emanuel Berg (2610) and 16-years old IM Nils Grandelius (2491). Organizers from Malmo are not that obsessed with reaching high tournament categories and are always willing to give a chance to young local players, even if the tournament will be only five rounds long. The defending champion from 2008 is Tiger Hillarp Persson, who is traditionally performing well at Sigeman Co.